Homer is on water skis, with the others on him, as he ski-jumps over sharks; everybody lands on the couch, but Homer is without his legs, which are in the sharks' mouths (a reference to the term "jumped the shark", describing a TV show that has reached its peak and is now declining in quality or has done something to cause it to decline prematurely)." "'Scuse Me While I Miss the Sky" is the sixteenth episode of the fourteenth season. 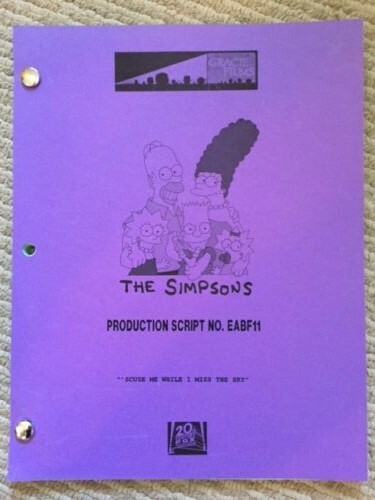 It originally aired March 30, 2003 on FOX. 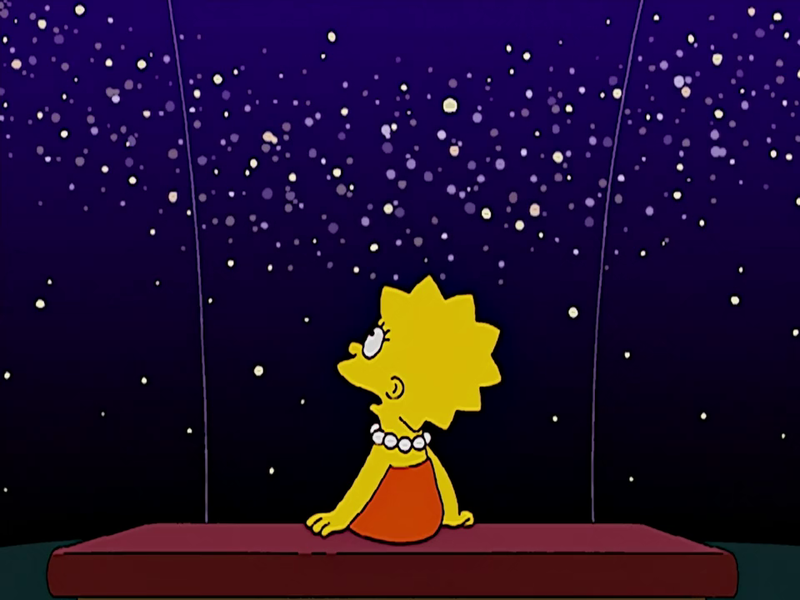 "When Lisa realizes she has no future, she decides to focus on astronomy, and her first aim is to make the city to turn off the lights to watch the comets rain at night." Declan Desmond visits Springfield Elementary School and interviews the kids for a documentary. However when interviewing Lisa, he says that she has no future due to having interests in different careers. To prove him wrong, Lisa visits the Springfield Science Museum to find a topic that interests her. After rejecting several topics, she decides to take up astronomy. She convinces Homer to buy her a telescope. Lisa goes to a hill to watch the sky, but the town's light is making it difficult to observe the stars and planets, something Professor Frink describes as light pollution. At a town meeting, Lisa proposes that during the night, all lights are to be turned off so that everyone can enjoy the night sky and the meteor rain. The town agrees and lights are turned off. First, people enjoy the stars and the peculiar constellations, but this results in increased crime, so in another town meeting, Mayor Quimby turns on all city lights so that they are as bright as the sun. Meanwhile, when Bart is being interviewed by Declan, he notices Nelson is popular because he stole a hood ornament from a car. Bart then decides that the only way to redeem himself is to steal one to be as popular as Nelson, Jimbo, Kearney and Dolph. He tries by painting gold Maggie's pacifier, but the bullies soon realize it's fake. He has trouble finding one since many were already taken during the time the street lights were turned off, but focuses on trying to steal the ornament from Fat Tony's car, which proves to be a challenge now that all street lights are turned on during the night and he is very hostile when people touch his ornament. But Bart isn't the only one suffering from the lights, they're so bright during the night that the entire town can't get to sleep. Lisa is frustrated because she will miss the meteor rain. Seeing that both Bart and Lisa are looking for the same thing, they work together to get a very drowsy Homer to give them access into the Nuclear Power Plant to override the main circuit. Homer is so tired he is easily fooled by making him think he will play with the hands with Maggie to activate the gate's hand control. They enter and pull the main lever to its maximum. The lights start to explode everywhere, leading to a mass blackout. The town gathers into a mob which immediately turns peaceful after they look at the meteors. Professor Frink discovers a meteor that fell behind the observatory that contains some matter would prove the existence of live out of Earth, but an alien inside goes away. Bart steals the long-awaited hood ornament from Fat Tony's car. Later, Declan plays his documentary, in which some kids talk about their desires, one of which is Milhouse wanting to become a baseball player (though he couldn't hit any of the tee-balls).